I'm sure you can, and what better way to help small business owners like you then to share some of my favorite tips from our country's top industry experts in their respective fields. Below you will find a personal collection of some of my favorite golden nuggets from the country's brightest minds in the areas of startups, small business, corporate finance, internet marketing, social media marketing, blogging, working online, selling online, branding, and much more. Top 25 Small Business Tips from Leading Industry Experts in the U.S.
1. Lisa Barone of outspokenmedia.com. "If you want people to talk about you, you got to listen to something nine-time Grammy-winner Bonnie Raitt told us way back in 1991. People want to talk and you gotta give 'em something to talk about." 2. Chris Brogan of chrisbrogan.com. "I continue to believe that affiliate marketing is the best possible method of extending your salesforce on the web. I think that finding passionate people with applicable communities and audiences and then enabling their ability to profit from selling a product they support into their community is the gold standard of marketing on the web." 3. Tim Berry of timberry.bplans.com. "Remember that your business plan should be only as big as what you need to run your business. While everybody should have planning to help run a business, not everybody needs to develop a complete formal business plan suitable for submitting to a potential investor, or bank, or venture contest." 4. Jim Blasingame of smallbusinessadvocate.com. "We sometimes get so wrapped up in our business that we risk losing our grip on the things that really matter: health, happiness and those who love us. Life is short! Enjoy every sandwich!" 5. Anita Campbell of smallbiztrends.com. "When competition is tough as it is today, you have to have more arrows in your quiver. What's the answer? Today it's 2 things. Search is one. I would add social media as the other. If you don't at least know the basics of SEO and social media, you'll have a harder time growing your website and your business." 6. Marco Carbajo of businesscreditblogger.com. "Avoid putting your personal credit and personal assets at risk and start establishing business credit under your corporate entity. By doing so you will have the ability to obtain 10 to 100 times greater credit capacity." 7. Brian Clark of copyblogger.com. "People want compelling content, so compelling content is your advertising. And using the right words in the right persuasive way determines not only how well your site converts visitors into sales, but also how much traffic you get and how well you rank in search engines." 8. Gerri Detweiler of ultimatecredit.com. "If you actually do own a business, keeping your business and personal purchases separate can be crucial for tax purposes." 9. Melinda Emerson of succeedasyourownboss.com. "You must do something every day to tell the world you are open for business. Even if you just make one sales call a day, send out one helpful tweet a day, write one article to promote your expertise, or send one follow-up email a day." 10. Tim Ferris of fourhourworkweek.com. "One of the most valuable exercises an entrepreneur can perform is to take a step back, not looking at what's popular, not consider what everybody is doing or what people are expected to do, and really ask what rules you need to set for your business, from a process standpoint and a cash flow standpoint, so that it can be successful." 11. Seth Godin of sethgodin.com. "You have to go where the other guys can't. Take advantage of what you have so you can beat the competition with what they don't." 12. Brian Halligan of hubspot.com. "Change the mode of your web site from a one-way sales message to a collaborative, living, breathing hub for your marketplace." 13. John Jantsch of johnjantsch.com. "Craft a strategy that compels customers and partners to voluntarily participate in your marketing, to create positive buzz about your products and services to friends, neighbors, and colleagues." 14. Guy Kawasaki of guykawasaki.com. "Don't wait to develop the perfect product or service. Good enough is good enough. There will be plenty of time for refinement later. It's not how great you start; it's how great you end up." 15. Diane Kennedy of usataxaid.com. "Each product and product line must stand on its own merit. There is no room for dogs in a company that is bootstrapping." 16. Rieva Lesonsky of smallbizlady.com. "Whether your business is just starting out, or whether you're a seasoned veteran, marketing is a must. And during an economic downturn, marketing matters more than ever. Smart marketing can give you the edge you need to succeed in any economy." 17. Joel Libava of thefranchiseking.com. "The entire business world is learning that transparency is really the way to do business. Not many industries will be able to escape this fact in the near future." 18. Mike Michalowicz of thetoiletpaperentrepreneur.com. "Success is not determined by your background or your cash on hand. It is exclusively dictated by your beliefs. If you truly, emphatically believe you will succeed, you will. If you don't, you won't." 19. Barry Moltz of barrymoltz.com. "Investors put their money in people not a business. The better team you have, the more money you will be able to attract. Get people on your team that have industry expertise and that have been there before. Investors want track records." 20. Darren Rowse of problogger.net. "Aim to be unique, remarkable, compelling, and most of all, useful, and your blog will have success long after many other bloggers have all given up." 21. David Meerman Scott of davidmeermanscott.com. "On the web you are what you publish." 22. Brian Solis of briansolis.com. "Create a space in the online ecosystem that truly represents your business and cultivates your customers' loyalty and trust." 23. Steve Strauss of mrallbiz.com. 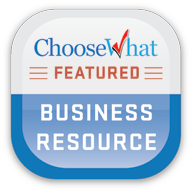 "Often untapped sources of funding are your own suppliers, wholesalers, and distributors. These are large businesses that want your business and may be willing to lend you some money or inventory, provided they believe in your vision and plan." 24. John Warrillow of builttosell.com. "So how do you know if you have a scalable business? Here are the three criteria: Teachable, valuable and repeatable - that's your valuation trifecta." 25. Ken Yancey of score.org. "Test your marketing message on a mentor, adviser, coach or someone who you believe represents your customer base. Ask them specific questions about whether or not the message gets across." One last tip worth mentioning even though it's so simple yet so powerful is from none other than Pete Cashmore of mashable.com which is "Do what you love." So there you have it: 25 of my favorite small business tips from our country's leading industry experts, all sharing their invaluable insights on how you can succeed in business today. About The Author: Marco Carbajo is founder of the Business Credit Insider's Circle. Looking for help for your small business? Claim Marco's popular FREE business credit seminar ($597 Value), available at: startbusinesscredit.com. Follow Marco on Twitter @MarcoCarbajo and read more of his insights on businesscreditblogger.com. As a savvy business owner, you know you should tap in to social media, ramp up your SEO efforts and work on your website and email marketing. But how do you grow your business online while still managing everything else in your company? Ultimately, you'll learn 30 fast and easy ways to grow your business online...and you can do it all without having to become an expert on every topic! Click here to download your free guidebook. 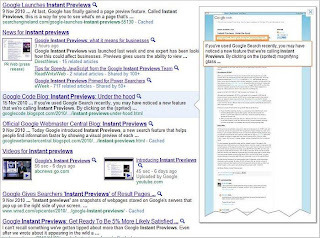 Google wasn't satisfied with just having Instant Search, now it has introduced something called Instant Previews. Searchers and web users can now browse a large instant "preview" of a site's content by placing the cursor over the small magnifying glass displayed beside each listing. These previews are large and Google sometimes highlights a major paragraph or quote from each displayed site. Searchers can get a general look at the layout and design of a site, onpage graphics and bold headlines can usually be seen from the preview. However, small print and the general content of the page can't be read, so searchers will have to click through to your site if they want to read your information. Assuming of course, they don't find what they're looking for in the headlines or bold print. Whether searchers will use this new feature remains to be seen, but these instant previews could have some ramifications on who gets the "click through" to their site. One would also reason that getting the top spot in the rankings have diminished somewhat, if searchers can quickly preview all of the top 10 listings and then make their decision. So they might not click the top listing, but decide one lower down is worth clicking. This could make any listing on the first page more worth having, not just the top one. This doesn't really affect any of your SEO strategies and you should be optimizing for the search engines as usual. After all, getting those top rankings for your targeted keywords in the major search engines is what brings in the quality traffic to your site. In this regard, it's business as usual. However, Google's Instant Previews does change the whole nature of SERPs or rather Google's search results in that webmasters and marketers have another hurdle to get past before they get that final click. Searchers might click your top number one ranking preview and decide your page is not up to standard or it's not what they're looking for, and can quickly try out the other listings instead. From Google's perspective these previews could improve the "overall" quality of their results because searchers will come away happy, especially if they have not wasted their time clicking on a link, only to find it's not what they're looking for. Now they can easily find the right results more quickly and efficiently. 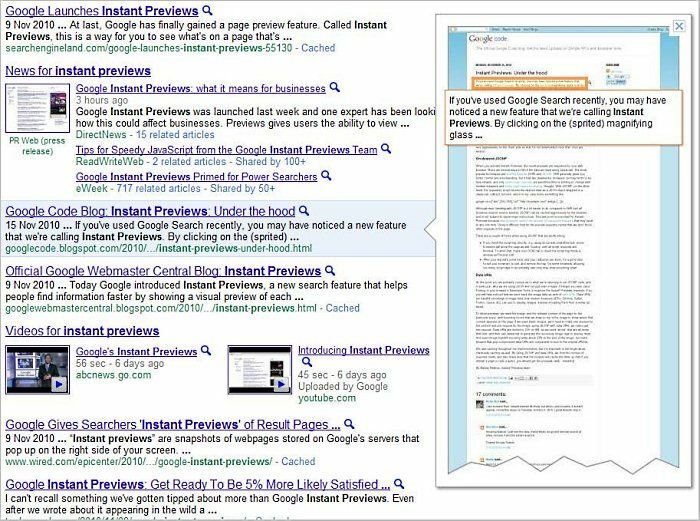 For the webmaster or online marketer, these new Instant Previews can be seen as another chance to get that all important click. They must make sure their page design is up to scratch and featuring a catchy headline which draws visitors to their page or site. Also, highlighting a well worded summary could help attract more of these visitors. So too, would placing your main keyword phrase in bold print so that it can be read from the preview. Needless to say, webmasters/marketers must always keep their targeted keywords front and center. Highlighting them on your page in the main title is already a given, but now you should make sure they can be read from the preview. This could possibly give you an edge with it comes to getting that click from Google. On a more general note, these previews also add to the time searchers will spend on Google's results pages. Google has been steadily focusing on this factor in recent months. Why? One good reason - the longer a searcher stays on your page the more likely they are to click your paid ads. Stands to reason, if the searcher can't find what they're looking for in the so-called "free organic listings" (actually, truth be told, for very lucrative keyword phrases these are not free, nor organic) they will look to the paid Adwords listings. 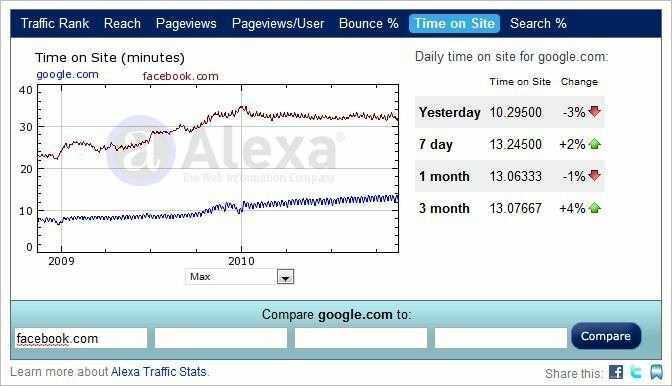 If you check out the average time spent on Google, according to Alexa, in 2009 it was around 7 minutes and now in 2010 that average has jumped to around 14 minutes. And that's before both Google Instant Search and Google Instant Previews are fully rolled out and implemented. One would expect that number to go much higher. While this is nowhere near Facebook's average time of 31 minutes, Google has still doubled the time it had only a year ago. No wonder, Google can afford to give their employees that 10% raise, they have probably earned it. Nor should Google be criticized for doing all of this, they are a business and their goal is to bring in more revenue. Besides, these previews will no doubt improve the effectiveness of Google's SERPs. Searchers can more quickly find what they're searching for on Google and come away happy. A satisfied customer is the ultimate goal of any business, why should Google be judged any differently. 1. Improve Your Graphics - These can really grab the searcher's attention in the preview so it's vital to have eye-popping graphics right next to your important information. 2. Create Great Headlines - Good headlines quickly capture the searcher's attention and draws him/her to your page; just make them bold enough to be seen in Google's previews. 3. Write An Informative Summary - Place your important information in a short summary which also captures the viewer's attention. Entice these viewers to visit your site or page. 4. Take A Multi-Layered Approach - Just don't aim all your marketing towards free organic search, but try video listings, news listings, image listings... to get other ways onto Google's first page. 5. Finally, PPC Advertising - This is probably not what you want to hear, but paid listings through Google Adwords is another option. Besides, for extremely lucrative keywords, as more and more major companies throw major funds into SEO and Keyword Link Buying, organic search is not really free or even available to everybody anymore. For the small-time webmaster or marketer, paid listings in Google may be your only option and that option is quickly becoming too costly for many. Of course, how Instant Search and Instant Previews play out in the near future is still open to wide speculation. Will searchers even use those added features in their daily searches? Or will users opt–out and go back to a more gentle, less hurried Google? One thing that all of us can be sure of, Google will be constantly rolling out new features and innovations just to make all our lives a little more interesting. I believe if you asked any webmaster or online marketer what their most important aspect of running a site would be, you would get an answer that's some way related to traffic. Mainly because traffic is your site's lifeblood, actually without traffic you really don't have a site at all. Traffic brings in the leads and the sales. Quality traffic is what produces your online revenue, whether from advertising or from sales on your site. Now, I have sites which get less than 50 visitors a day, I have a few sites which get around 200 visitors and I have one site which gets around 2,000 visitors a day. Don't jump to any conclusions, some days the site getting 50 visitors can make just as much as the site getting 2,000 visitors. It all has to do with the quality of the traffic and how well it converts into a sale. And of course, it all depends on what you're selling... an LCD cleaning kit for $20 bucks or a gaming laptop which sell for $2000+. Regardless, you have to get that traffic in the first place if you want to earn an online income. The more traffic you have, usually, the more you will make; at least this has been my experience. Since traffic is very important to me, I keep a lot of records and stats on where my traffic is coming from on the web. I have to know what produces the quality traffic and how to get it. The majority of the traffic to my sites comes from the search engines, mainly Google. It is my high rankings for my targeted keyword phrases which brings in the most and the best quality traffic to my sites. Get the SEO right and build a lot of quality one-way links from related sites and you will get the traffic. Another tactic, don't just create a website with only 10 or 20 pages - create one with 1000 to 5000 pages. I know this takes time but consider your site like a long-term business which you will keep building for years. Produce plenty of quality content and you will get plenty of quality visitors in return. Works for me. Another very effective way to bring in quality traffic to your site or sites is article marketing. Just write short articles related to your site's keywords and place your keyworded links in the resource box. Distribute these articles all over the web. Right now, what is working for me, is writing unique articles which I only place on one important site. I am using this technique with sites like SiteProNews, Buzzle and many more. Article marketing is still one of the most effective ways to get quality traffic, just try it. I know, I know, this can be very expensive, but PPC can be the quickest way to get quality traffic to your sites. Just be careful and approach it with kid's gloves until you find campaigns which work for you - then scale them up. Microsoft Adcenter and Yahoo Marketing have now joined forces and I find this is producing good traffic for me. Google Adwords is probably better, but they are a real pain to work with and have become too expensive, at least for my keywords. But if you have the resources, don't rule out Adwords or any of the PPC programs. From Facebook to Twitter to LinkedIn, social media sites can provide a lot of traffic and word of mouth advertising for your site. For me, even though I haven't worked these sites to their fullest potential, I still get traffic from them. Getting your pages bookmarked in some of these sites can bring in a flood of traffic overnight, while most of this traffic will be temporary, you can get a lot of sign-ups to your newsletter and different follow-up lists. While not exactly in the same group, I have had some success with YouTube videos which also bring in targeted traffic. Don't ignore these social media and video sites in your traffic strategies. This is another one of my major sources of "repeat visitors" to my sites. You must be constantly building up your different contact lists for further follow-up. This will bring in more visitors than you would expect, especially if you put some simple viral messages in your emails. If you supply valuable information, people will recommend your content to friends and co-workers; again word of mouth can bring in a lot of traffic especially in this age of Facebook and Twitter. freetraffictip.com - run by Tinu Abayomi-Paul, one of my best sources for free traffic tips. Excellent. trafficology.com - this site and newsletter gives you off-beat ways to build traffic to your site. Highly Recommended. trafficsecrets.com - if this one is still open, John Reese has a few very good products on traffic. Recommended if you can afford it. About The Author: Titus Hoskins is a full time online affiliate marketer who operates numerous niche sites, as well as two sites on Internet Marketing: internet marketing tools or try here free marketing courses. Your website is your "storefront". You should put as much into your virtual storefront as you would to the front window display at a traditional store on the Main Street. Your website needs to attract customers and keep them coming back for more. 1. Where do your eyes go first? A visitor to your website typically has an attention span of only a few seconds. That means your website must "hook" them in that amount of time. Make sure the first thing they see/notice is something interesting enough to buy you more time. 2. Do you know right away what this website is about? Again, you have limited time to get your message across. If there are too many distractions, a site visitor may not ever know what you are selling. 3. Is the important information "above the fold?" 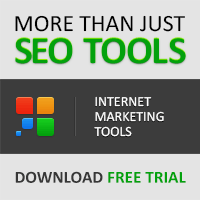 Most site visitors want to know the details without doing a lot of work. If they have to scroll down to find the main idea, they will likely leave earlier than you'd like. Make sure that your Unique Selling Proposition (USP) is clearly spelled out. This is a piece of information that says in one sentence or less why someone should do business with you. Make it clear and prominent on your site. 4. Can you easily find the benefits of the product/service? A visitor to your site wants to learn as much as possible about the benefits of your product or service. Features are important, too, but the most important thing a visitor can take away is a sense that this product or service will make an impact in their life… for the better. If customers like what they see, it is important to move them along quickly. There should be a prominent, clear call to action on your website. Your call to action may be to buy now, start a free trial, learn more or something else. Make sure that you are not sending mixed messages with too many calls to action. Choose the one or two that matter most and make them easy to find. 6. Are the colours and images aesthetically pleasing? If your website is too busy or jarring, you will lose visitors. Take a little time to coordinate colours and to implement high quality images that add to your message. 7. Is the font easy to read? Make sure your font is easy to read and is not distracting. Don’t get fancy; just stick with a simple, sans-serif font in a contrasting colour to the background. 8. Are there bulky sections of writing anywhere on the page? Long, bulky paragraphs are likely to get skipped. Try breaking up your copy into smaller sections that get the point across quickly. 9. Do the menu items clearly tell you where they will take you? Site design and usability are important considerations that often get overlooked. Think about what information you would want to find if you visited this site, and plan your menus accordingly. There should almost always be an "about us" and "contact us" page. 10. Is there an easy way to contact the business? If your website does its job, you will likely have interested prospects who want to learn more or simply have a few questions. Make sure they have an easy way to find you. Potential customers also want to know that they will be able to get a hold of you if needed in the future, whether for warranty service or support. 11. Can you find out more about the owner or employees of the company? Visitors often want to know that they are dealing with real people. Having an "about us" page is a great way to show the world why you are the best one to handle the job. Include photos, too – everyone likes to associate a face to the business. 12. Do you feel personally connected? Visitors who feel personally connected will be more likely to stick around and/or become a customer. Tell your story, and tell them why you are the right choice. You can personally connect with your visitors by being honest, using a conversational writing style and including real testimonials from other customers. 13. Is the writing corporate or conversational? Corporate writing is good for… well, big corporations. But a small business shouldn't pretend to be a big, formal entity that is disconnected from the public. Your ability to relate to your customers is a big reason why they will eventually choose you – start right away with engaging, conversational tone in your writing. 14. Is there a web form above the fold? 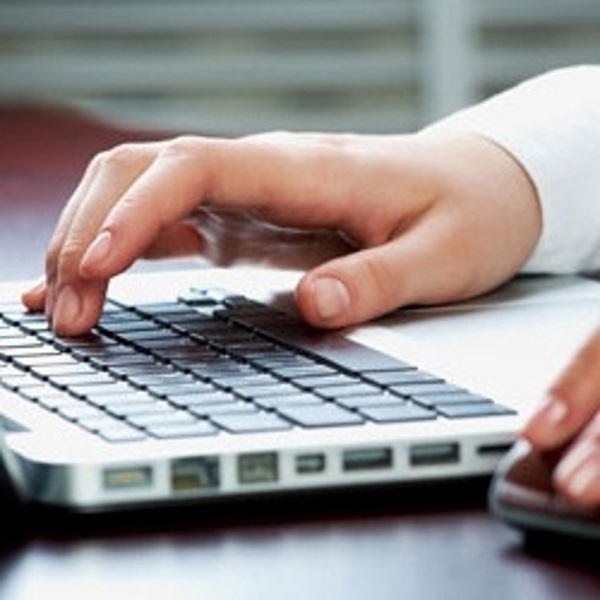 A web form is really the only way to capture leads from your website visitors. Make sure that it is in a visible place above the fold. The better it looks, the more people will fill it out. 15. Is the offering appealing enough to make you want to give your email address? Your web form should also offer an incentive piece to spark a visitor's interest and convince them to give you their information. Make sure that this incentive piece is appealing – offer real tips, actionable advice or special deals that will immediately help your prospects. Multimedia is a great way to add character and interest to your website. Videos, podcasts, tutorials and other multimedia options allow you to present your message to your visitors in a way that appeals to them. 17. Are there links to social media? Social media allows you to communicate with your prospects, and it allows them to communicate with each other. Include links to your blog, Facebook, Twitter and other social media accounts. Make it easy for everyone to find you on social media… even if they don't fill out your web form, they may choose to follow you in some fashion. Once you determine the areas of your website that need improvement, develop a plan to start implementing changes. You don't have to do them all at once - do a few at a time until you have a website that you can be proud of (and one that consistently brings in sales).